It is rare to find Coco and Luxie close enough together to a photo of both of them. When Luxie was a kitten, they played together a lot. Now that she is older, Coco doesn’t seem to want to have too much to do with her. Sometimes she just walks by her and hisses for no reason. I think Luxie misses their fun times together and always looks a little confused when Coco ignores her or hisses a bit. Another rare thing about this is that Coco is at the table that pretty much belongs to Luxie and I. 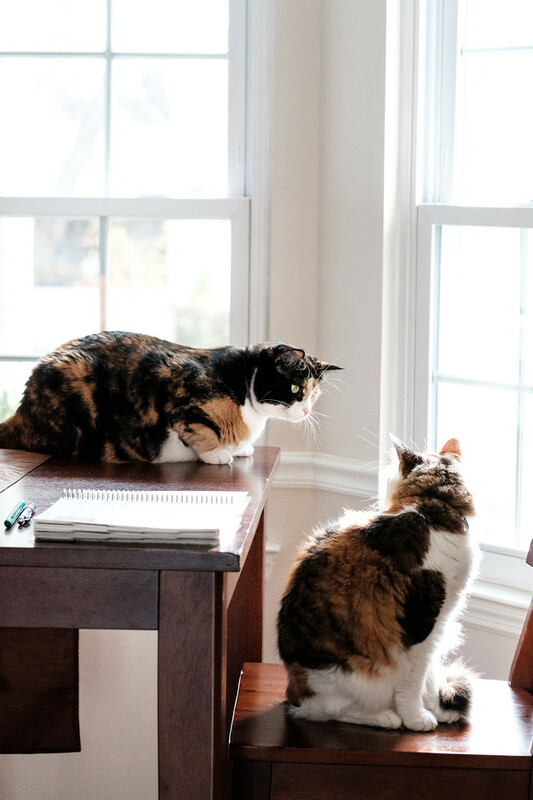 If you follow our Saturday Caturday posts, you know that table is where Luxie and I do our morning planning. For some reason, Coco jumped up on the chair and Luxie seems to be wondering what’s going on! You also see the extent of most of my fall decorating. Anyone else follow people on Instagram who have fall decorating down like a science. It’s all gorgeous. White pumpkins. Fall quotes. Harvest wreaths. Me? I pull out a storage container in the garage marked fall decorations. In it, is one white ceramic pumpkin (you can see it here) and one orange ceramic pumpkin and two fall table runners. I pull the out, set them up. Done. Nothing Instagram worthy. For my artsy photo, I used Topaz Labs plugin. Too bad they don’t get along better. It happens though. Cats do what cats do. They are both most beautiful. They are such beautiful cats, I miss mine but unfortunately today cannot have one as I have a dog. We would have a doggie too if my husband wasn’t allergic! Such beautiful sweeties though, alone or together! Thanks for joining the Thankful Thursday Blog Hop! I would love to have a picture of all 8 of ours together with it’s just a dream right now!!! I am fine with that, I use collage!! Happy Sunday! It would be tricky to get all 8 of you together! Well, she could play, she just chooses not to! Maybe the two at the same table will become a regular thing? Anyways, I like the simplicity of your decorations. Too much is bad, and this house it would cause chaos with my mousing activities. 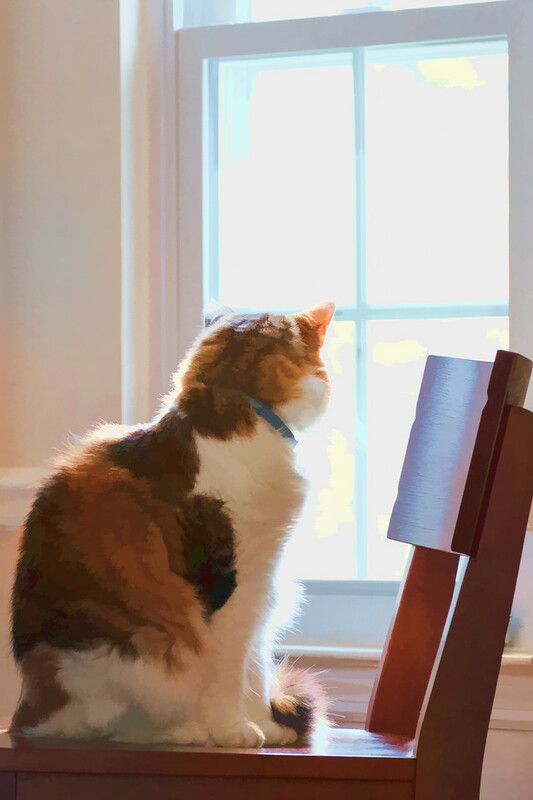 We both love the photo effect this week and the silver blue on the chair back– and of course Coco, too. I definitely think less is more. Though I do admit to admiring all the crazy decorated homes on Instagram! Poor Luxie! That first image is so cute. It’s like, “Hello! Come play with me.” It makes you wonder what goes on in their heads. I’m glad to say that Alice and Arya still play together every day. Alice was five when we got Arya (she was about four months old) and it didn’t take her long to warm up to her. She’s eleven now (Arya is seven) and she still likes to play. She often is the one who initiates the play too. From time to time, I even find them sleeping in the same vicinity. Perhaps not side by side, but in close proximity. I guess I’m lucky they get along so well. I wish I knew what they were thinking too. I think Luxie still wants to play, but Coco just isn’t having any of it lately. I’m ready to start decorating for Christmas too! It seems like everyone (or at least my blog readers) aren’t that much into fall decorating. They are both so pretty. I can’t figure out cat behavior. My cats change friends often. 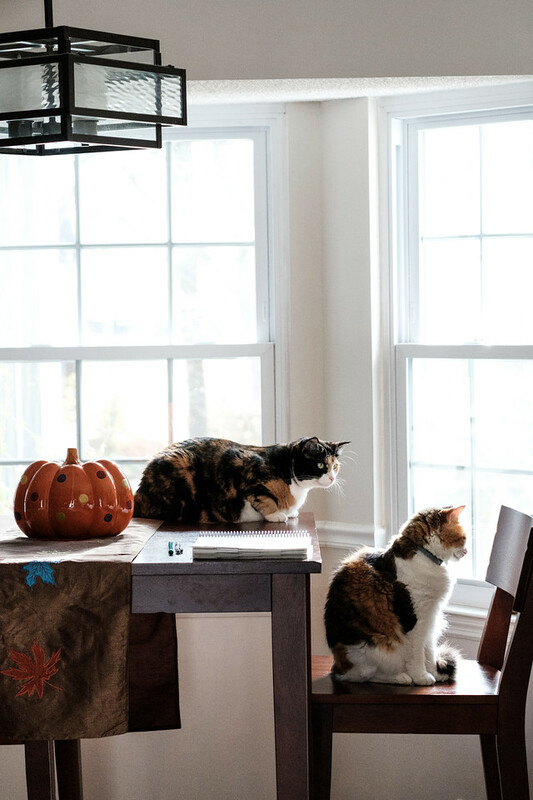 Actually, the colors of your two beautiful cats are perfect for fall decorations ! Such beautiful cats and the pictures are nicely done! Good job catching them together. Yes, I was lucky. They only stayed together a few minutes! They sure are beautiful girls. So photogenic. Too bad they don’t cuddle together and get along. Sometimes that happens though. I’m glad I’m not the only one that does minimal decorating! LOL! Luxie does look puzzled to see Coco sitting on the chair. Lovely art as always.